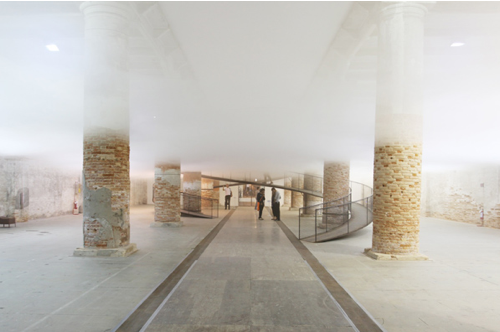 Imagine walking inside a building filled with man-made clouds. Get your fill of forced perspective photography. A scattered clock that goes from chaos to order and back to chaos again. OK Go's latest music video featuring some very talented dogs. Rue Magazine just made its debut and it's full of design inspiration. A tiny yarn asparagus?! GAH! Now I want everything here! And while I'm dreaming I might as well throw in a wish for a cute Firefox, too. That's what NYC looked like today! It was so hazy! p.s. that knit asparagus is possibly the cutest thing I have ever seen! And I just couldn't stop looking at the forced perspective photography. Very very cool. I know you've had a great start to your week, so I'll just say Happy Tuesday and New Beginnings!!! Hope you had a good weekend, and are having a good week. I don't think I'd like working in that building too much. Yup, a great start to the week. Hope you're all doing wonderfully and I've much to catch up on with you regulars. I'll swing by your blogs soon enough!